In brief: Brazil has made an almost perfect start to the 2017 Pan American Surf Games in Peru, an “ISA Worlds of the Americas” style event that also acts as a warm-up for the 2019 PanAm Games. 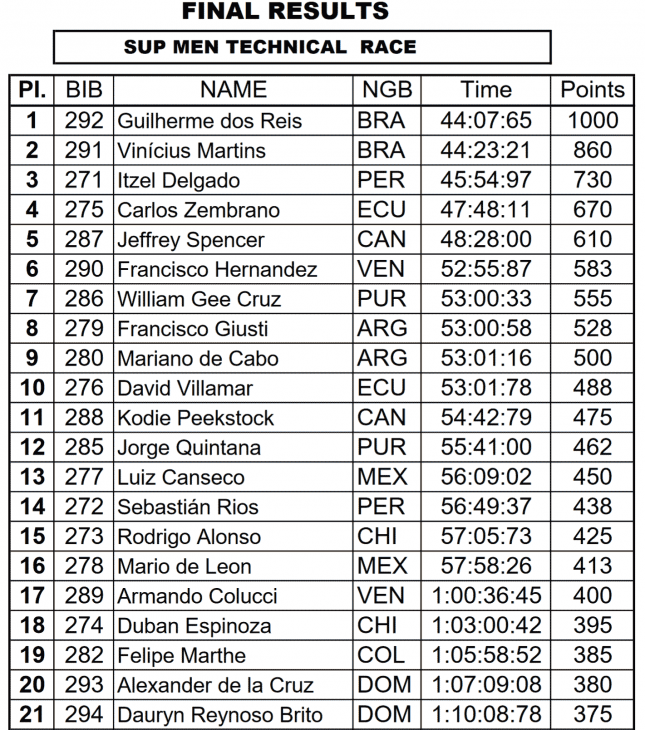 Young gun Guilherme dos Reis took gold just ahead of team mate Vinnicius Martins in yesterday’s beach race, while Lena Ribeiro Guimarães made it a double victory for Brazil in the women’s and Aline Adisaka picked up a bronze to put all four SUP racing team members on the opening podium of the event. It’s been a busy week for Brazil’s stand up paddle community with the nation being confirmed as host for the 2018 ISA Worlds just a few days ago. Hometown hero Itzel Delgado took bronze for the host nation yesterday, while Maricarmen Rivera picked up a silver for Puerto Rico as solid waves at Punta Rocas produced a tricky but entertaining course. 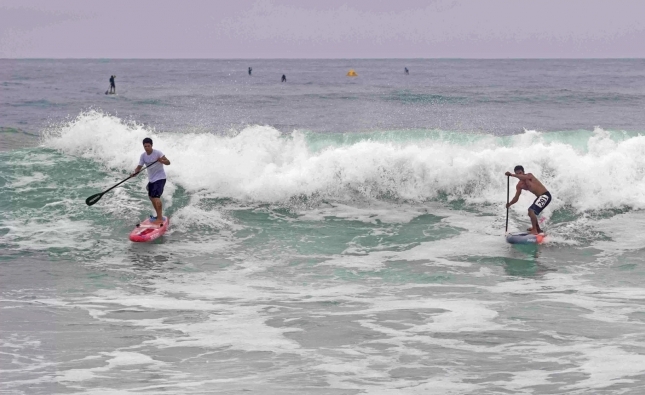 The 13th edition of the PanAm Surf Games are a pre-qualifying event for the 2019 PanAm Games proper. Not sure what pre-qualifying means but I assume it’s basically a warm-up (the actual qualifiers will be held next year). The 18th edition of the Pan American Games (the Olympics of the Americas) are scheduled from July 26 to August 11, 2019, in (almost) the exact same location as this week’s event: Lima, Peru. 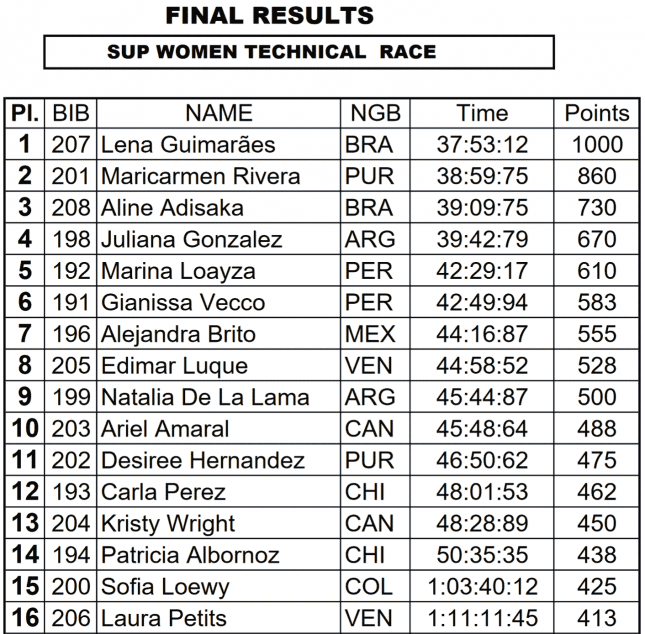 Yesterday’s beach race featured athletes from 11 nations: Brazil, Peru, Ecuador, Canada, Venezuela, Puerto Rico, Argentina, Mexico, Chile, Colombia and the Dominican Republic (Team USA isn’t at the event). There is no long distance race or sprints, so the racing is finished, but Brazil can add to its medal haul in the regular surfing, longboarding and SUP surfing events over the next couple of days. Latino paddling hub PuntoSUP.com has more coverage (though you may need Google Translate).